UPDATE: As a result of Sylvia Lancaster’s campaigning, attacks on people pursuing alternative lifestyles will now be treated as hate crimes by Greater Manchester Police. Five years ago today, Sophie Lancaster passed away peacefully with her Mum & Dad by her side. It was the smallest of mercies afforded to them, but perhaps one of the most important. Sophie, twenty, had been walking through Stubbylee Park in Bacup, Lancashire, with her boyfriend Robert Maltby at 1am when Maltby was set upon by a gang. As Sophie knelt on the ground, cradling his head, the five teenagers turned on her, kicking and punching her face and body. She never regained consciousness and her parents took the decision to turn off her life support thirteen days later. Robert survived. He stated shortly after being released from hospital that he wished he had been the one to die. Arguably any case that involved such violence would have attracted a great deal of publicity, but the fact that Sophie and Robert were goths and were targeted by the gang because of their appearance added to the interest. Fortunately most people in the UK understand that to be civilised means that your first reaction to difference in others, whether it be their skin colour, religion or dress, should not be to try to beat it out of them. I’ve been on the receiving end of intolerance over my appearance, as have many of my friends. I, and I’m sure they, will be eternally grateful to people like Sophie Lancaster’s parents, who fought through their personal pain to draw something positive from their daughter’s murder. 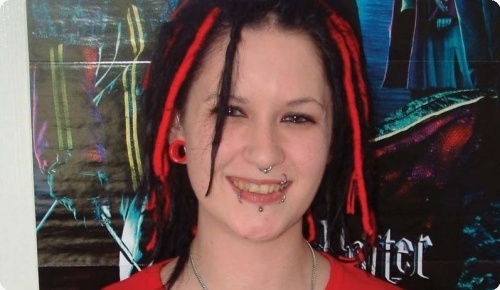 Their tireless work with the Sophie Lancaster Foundation, an organisation set up to “focus on creating respect for and understanding of subcultures in our communities” and the wider metal community, has resulted in Sophie becoming a positive symbol of greater tolerance in the UK, and not simply another victim. I never met her, but I’m sure she would have been so proud of that.